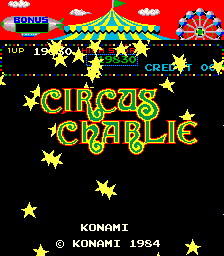 Circus Charlie was an arcade game developed by Konami in 1984. According to the flyer, Konami billed the game as "the first authentic circus game in history!" Whether that's true or not could be debated, but it did feature a clown who had to perform death-defying circus tricks for the amusement of the audience. 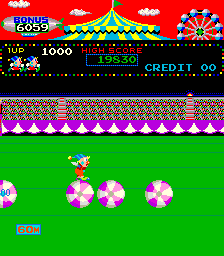 With six different events to tackle, Circus Charlie was something of a Track & Field for clowns without the button mashing. Charlie has to complete six different circus stunts for the crowd's amusement. He must ride on the back of a lion and direct him to jump through hoops of fire, and over burning pots. He must walk a tightrope while jumping over monkeys headed the other way. He must bounce from trampoline to trampoline while avoiding fire breathers and knife throwers. He must jump from one oversized ball to the next without touching the ground. He must stand on the back of a horse and hurdle a series of springboards. And last but not least, he must swing from one end of the circus to the other entirely by trapeze. A few different versions were released into the arcades. Some allowed you to select which stage you would like to play at the very beginning of the game while others only allow you to select a stage after you completed all six in order. Konami converted the game for play on the MSX home computer, and licensed the game to Soft Pro who converted it to the Famicom. Parker Brothers obtained the rights to bring the game home in America. While they had plans to release it for the Atari 2600 and the ColecoVision, the video game market crash of 1983 put an end to that idea, and they ultimately only released the game for the Commodore 64 in 1987. It was contained in the release of Konami Classics Series: Arcade Hits in 2007 for the Nintendo DS. Joystick: Use the joystick to direct Charlie to the left or to the right in most scenarios. 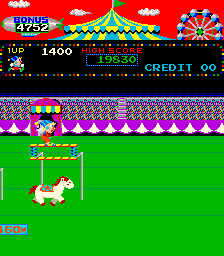 In the Horse Hurdle stage, the joystick is used to control the speed that the horse runs at, and in the Trapeze stage, the joystick influences Charlie's momentum. Up and down are not used in this game. Jump: Press the Jump button to make Charlie jump in most scenarios. It is not used in the trampoline stage. In the Trapeze stage, it is used to make Charlie let go of the Trapeze he is currently holding. 1-2 Players: Press either button to begin a one or two player game. 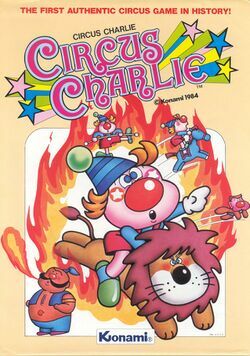 In this event, Charlie must ride on the back of a tamed lion, which is no challenge for a practiced clown like Charlie. What is a challenge is making him jump safely through the blazing hoops of fire and over the burning pots of oil. In some cases, he has to do both activities at once, which makes his timing critical. The hoops slowly advance on their own while the pots are stationary. In this, the easiest of the six events, it pays to be patient and wait for hoops to line up with burning pots of oil to make clearing them at once easy. Also be on the look out for two hoops that must be leaped as one. Occasionally, you will see a higher small hoop with a money bag in it. You are not required to jump these hoops (Charlie will pass safely beneath them), but the money bags provide bonus points, so consider grabbing them if there are no other threats in the way. If you jump forward over a certain oil pot, and then backwards over it, a coin will fly out of the pot. 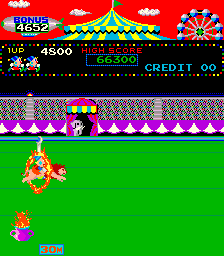 Leap forward to collect the coin (and jump over the pot, and probably a hoop by this time as well) for 3000 points. The pot that contains the coin will not always be the same one. If you manage to collect every single money bag from the small hoops by the time you reach the goal, an eagle will fly by and shower you with coins for bonus points. When you make it to the end of the tightrope, your jump will change and you can flip on to the podium to end the stage. 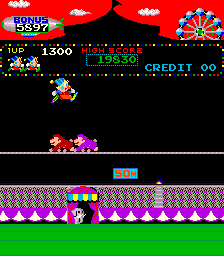 However, if you walk underneath the podium and touch the right side of the screen while still on the tightrope, a pile of money bags will appear on the podium, which you can collect for a 5000 point bonus. The Trampolines may appear easier than they actually are at first. Without using the jump button, you simply direct Charlie to the left or right, from one trampoline to the next. If you choose to remain in place, you will continue to jump higher and higher until your fourth bounce, which will jettison you through the top of the tent and you will lose a life. Move off your current trampoline after the fourth bounce, even if it's back to the left. You can't miss the next trampoline, but you can get hurt jumping between them. A fire breather spits balls of flame into the air, and a knife thrower tosses knives around. You must take special care to avoid jumping into either obstacle when leaping to the next trampoline. To avoid getting hit, bounce at least once before proceeding to the next trampoline. This is a general strategy, but it won't always work, so judge the situation accordingly. As a bonus (or to distract you) money bags as positioned above certain trampolines. You must bounce three times in order to bounce high enough to collect them. Be sure to move to another trampoline immediately after, or you will be sent through the roof. The last money bag before the goal is especially problematic. After you collect it and attempt to leave the trampoline before you lose your life, you will typically hit either the knife of the fireball on either side of you. If you manage to collect each and every money bag by the time you reach the goal, an eagle will fly by and shower you with coins for bonus points. Though not the hardest event in the game, Ball Walking can be especially challenging for beginners. Charlie must leap from one ball to the next without missing a ball and falling to the floor. The trick to this stage is understanding how Charlie jumps. When moving at full speed on the balls, Charlie can clear a distance that is roughly equivalent to three ball widths. If he stops and backs up, and then chooses to move and jump forward, that distance is shortened to two ball widths (it's actually the same distance, but the balls move slightly differently when you change direction.) Charlie has two options in this stage; jump from one ball to the next, or potentially skip a ball if the next ball is immediately behind. Jumping over a ball entirely to land on the next will earn you a 500 point bonus. You must be extra careful not to bump one ball into another, or try to jump from one ball when the next ball is too close. Back your current ball up until enough space exists between the balls before jumping. The trick to this stage is to jump very early. Because of the way Charlie lands, you stand a much better chance of bringing the ball under your feet if you jump too soon than if you jump too late. In this especially challenging stage, Charlie must ride on horseback while standing up. The problem is that he must also jump on top of, or clear over, a set of springboard hurdles. To help him out, Charlie can direct the horse to travel at three different speeds. Hold left on the joystick to make the horse run slowly, or hold the joystick right to make the horse run at its fastest. You can even change speeds every time you land on a hurdle, but not before, and not after until you land on the horse or another hurdle. Points are awarded to you based on the height of the springboard, and the number of consecutive jumps you've made. The biggest danger in this stage is misjudging the speed of your horse and the length of the upcoming springboard. The most common way to die is to jump over a springboard entirely when you meant to land on it, and slamming your head against the following springboard. In general, you're safest at the normal speed, and you should only adjust speeds when absolutely necessary to make corrections. As with the Ball Walk stage before it, jumping early tends to help you jump successfully. Remember that you need to jump from the horse successfully on to the goal platform at the end of the stage so don't get excited and run into it. The final challenge that Charlie must face is to travel from one end of the circus to the other entirely by trapeze. This is no easy feat. The joystick helps control Charlie's momentum. So pressing right helps Charlie swing forward more, and pressing left helps him swing back. Moving the joystick in time with Charlie's swinging helps him build up more height. Once you have the right motion established, you must time you jump from one trapeze to the next extremely carefully. It is best to make the switch from one trapeze to the next when both trapeze are swinging towards one another at the same time. The moment you let go of the trapeze is important as well. If you let go before the trapeze is at a forty-five degree angle, you will fly very far, but not very high. If you let go after the trapeze is at forty-five degrees, you will fly higher, but not very fast. Either is okay, as long as you judge the trip to the next trapeze accordingly. Occasionally, you will spot trampolines on the floor. It is very risky to attempt to use them, but if you manage to let go of one trapeze, bounce off the trampoline and pick up the next trapeze, you will be awarded a 2000 poit bonus. You are also awarded bonus points for consecutive immediate trapeze swings (meaning, you transfer from one trapeze to another on a single swing.) The timing of the trapeze swings rarely allows for this, but it can happen. If you manage to let go of a trapeze, hit a trampoline, and connect with the second trapeze after the one you let go of (skipping the next trapeze in the process), you will receive a 5000 point bonus. Not really hidden, but extraordinarily difficult to do. Every time you complete ten events, you are treated to a special bonus stage. 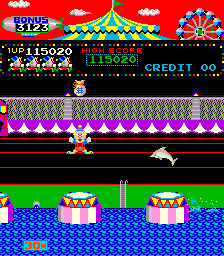 This stage is entirely similar to the ordinary Trampoline stage, however it is set in a flooded circus ring that contains "killer" dolphins. These dolphins like to jump over one trampoline, swim under the next, jump over the next one, and so on. They are the only threat to Charlie, but they are fast and must be watched carefully in order to avoid them. In general, it is a good idea to jump at least once for every dolphin that comes towards you. Sometimes the dolphins will come in pairs, one going up and the other going down. You will usually avoid both of them if you jump twice before moving on. As with the regular Trampoline stage, there are money bags positioned in the air. Collecting each one awards you an increasing number of points. If you collect every single money bag by the time you reach the goal, an eagle will fly by and shower you with coins for bonus points. The Commodore 64 version that was developed by Parker Bros. contains all six events. 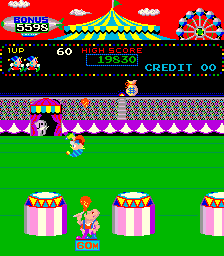 While the look of Charlie is close to the arcade, the screen resolution does not allow for as much detail around the circus. 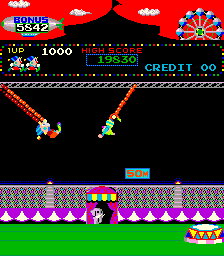 The MSX and NES versions contain a slightly different design for Charlie, and they also omit the Trampoline stage, leaving the other five stages intact. This page was last edited on 1 October 2016, at 20:07.